Learning proper core strengthening exercises for cats is just as critical for our feline Tripawd family members as it is for three-legged dogs. Whether human or animal, we all need strong core muscles (abdominals) to keep us from injuring our backs and hips during movement. 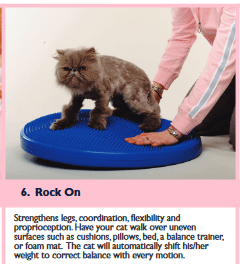 Much has been written about core strengthening exercises for dogs, but not as much for cats. Thankfully this is changing, and we aim to share these feline rehabilitation therapy tips and articles with you as we learn about them. Thanks to our amazing and helpful Trikitty members and bloggers, we have two feline rehabilitation therapy articles to share with you today. 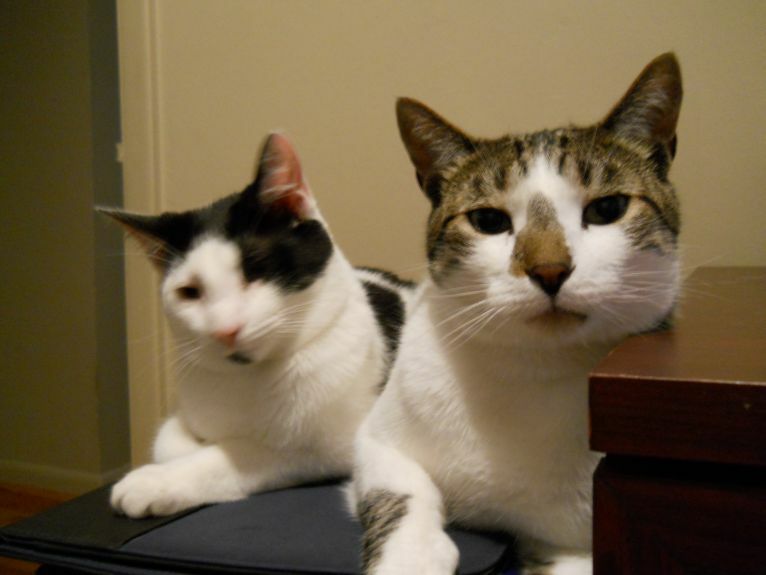 Recently, Harry the Tripawd Cat made it clear that losing a leg wasn’t going to slow him down. I just have some follow up wondering about core strengthening exercises . Are there any specific recommendations for cats (apart from the meercat pose, which we’ll be working on)? All the blog posts seem to be about dogs. I can’t imagine Harry using a stability disc….he’s stubbornly self directed. Although I do have a sit disc that I could give some things a try on. Well, she’s right. Animal rehabilitation therapy is a pretty new science, about a decade old. Many general practice veterinarians aren’t even aware of the many wonderful things it can do for any animal but especially the three-legged kind. Veterinary rehabilitation therapy science, studies and classes are usually focused on dogs, so as a result we don’t have much to share about cats. But thankfully that’s changing and more is being studied and shared about doing rehabilitation therapy for cats. We are SO grateful to our feline Tripawds members for doing some digging and sharing these downloadable articles with us. 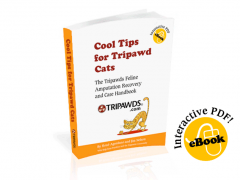 Download the article to see how to exercise your Tripawd cat! my vet suggested that Mona could maintain her remaining front leg mobility by playing with a feather by stretching her leg out to reach the feather. Mona likes to chase feathers on a stick on stairs and play with a laser light on the floor where she moves around really low to the ground. 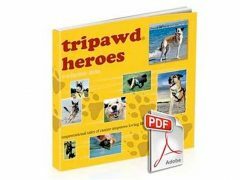 Here’s a Tripawds News blog post that tells more about front-leg amputee Tripawd cat exercises. If you have any more to share please let us know! All the trikitties thank you! You guys are simply the BEST!